Are there 80% discounts on cruises, as advertised by some other websites? Who qualifies for our military discount? How can you get any military deals applied to your cruise booking? How can we save you money even after your cruise is booked and paid for? What kind of military cruise deals and discounts do we offer? Do the cruise lines offer any military cruise discounts and benefits? How do we find all possible military discounts? Why should you book with Military Cruise Deals? How can I transfer my booking to Military Cruise Deals and get a discount? If you book directly with a cruise line, you will pay more than you need to. GUARANTEED. Looking for a veteran and military discount on your cruise? We’ve been in business since 2001! Thousands of military families trust us and you can too. Our Veteran and Military Discounts are guaranteed to be below the cruise lines’ lowest rate – always. We have no fees: no booking fee, no change fee, no cancellation fee – nothing. Our service is free to you. We always check to see if the rate and promotions are better for you at the time of your final payment! No one else does that. We offer a military discount on travel insurance, with free insurance for kids. All U.S., Canadian active and retired military, veterans and their families all qualify for our discounts. When you book with us, you are not helping a CEO buy a 3rd vacation home. You are helping real families put food on the table, send their kids to school and care for aging parents. Thank you for helping us help you! Your veteran and military status entitles you to discounts on cruise vacations! See what veteran and military discounts we have on cruises departing soon! 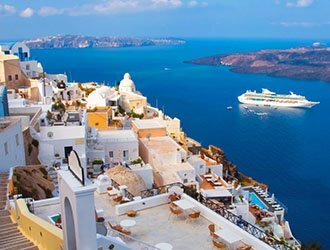 Click here to see all European Cruise Deals, including 2019 Spring Break Cruises! Went out of their way to help me. I will use Military Cruise from now on. I am retired from the Navy with 22 years of service. Thanks, - Frank Wade. Unable to call toll-free numbers from overseas? Call us at 256-485-6792 or use the Ring Me button. You may book directly here on our website. Our cruise search engine is configured to reveal the cruises with the lowest military discounted rate plus our extra discount is built right in. Need to book more than one cabin? Just book the first one and then start again to book the next one. If you want to confirm that the rate shown online was the lowest rate available to you and to get our additional discount applied, you can call us at 1-866-9-MILITARY (866-964-5482) to book the cruise with you over the phone. Be sure to tell the agent that you or a family member is part of the Armed Forces. We will then help you find the right cruise for you at the very best price. If the cruise line is offering their own military rate, you will get that rate for as many cabins as they allow. Even if no veteran and military discounts are offered by the cruise line, we will apply our discount to the other cabins. If you already booked with the cruise line directly before you found us and have not yet paid in full, call us anyway. We might be able to get a discount applied for you. Learn about the best, new cruise discounts and cheap deals the moment they are announced! Every day we look for the very best veteran and military discounts and special offers so you don’t have to! The really amazing, once-a-year-type deals are usually offered without notice and new last-minute deals pop up every day. Like us on Facebook to get notification of all deals and offers as soon as they come out! 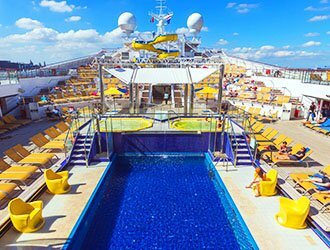 What’s new and awesome in cruising? We’ll tell ya – and give you some great tips! Is there such a thing as 80% discounts on cruises, as advertised by some other websites? Oh gosh no. We can hardly believe some sites make such silly claims! The reality is, their rates are usually the exact same as the cruise line’s. They are comparing their price to a ‘brochure rate’ to sound like they are offering a discount. What kind of military cruise deals and discounts do we offer? We simply offer a discount off the cruise lines’s lowest rate, usually about 5%. And we offer free travel insurance for kids, about discounted at around 50% off for adults. And we offer free bar credits on Carnival, free onboard credit on Norwegian - perks like that. Do the cruise lines offer any military cruise discounts and benefits? They all do something different. Carnival consistently has a special low rate just for military on most of their cruises. Royal Caribbean does! Just be sure to check the military box. Norwegian does not but you get OUR discount PLUS a $50 onboard credit from US in addition to any they offer!. Celebrity often has a military rate that’s about $100 less than civilian rates. Disney occasionally announces a huge military discount on specific cruises. Usually not on holiday or summer-time cruises. Mostly on cruises during the off season like in October, November, February and March. We check for those daily and post all details on our Disney page. Princess and Cunard offer a onboard credit to every military member. The amount is $50 to $250, based on the length of the cruise. The luxury and river cruise lines rarely have a discount specifically for military and veterans, but we book all luxury and river cruise lines and provide a discount for you when you ask us for a quote! How are our military discounts on cruises calculated? Thee cruise lines often have anywhere from 3 to 20 different farecodes we could use to price out a cruise. Some are higher, but come with a beverage package, or some amenity like that.When you book on our site, our site automatically uses the lowest available farecode offered by the cruise line for that cruise.Then, our site automatically subtracts a discount from that fare - and reveals this new discounted price to you.If you want to get the perks that are offered with higher-priced farecodes, you’ll need to call us to book. And we’ll help you use that farecode, and then still get our discount applied. How to find all possible military discounts? All rates you see on our site already have a military discount added (which means, actually, subtracted from the cruise lines’ lowest rates). So, if you were to compare our rates with the cruise lines’, you’d see that ours are lower. Also, if any other benefits, amenities or perks come with that cruise, we’ll have them listed under that cruise in the ‘BONUS OFFERS’ section. But honestly, the way you should go about this is looking for a cruise you’d like based on where you want to go, and when you can go. And then see what the best deals are that fit your needs. How can you get any military deals or discounts applied to your cruise booking? You don’t have to even try. We do that for you in three ways. First, our online booking engine is configured to check for all military discounts from the cruise line. Then our system automatically adds an additional discount from us. Finally, one of our expert agents personally looks at every booking to make sure its been done correctly, and all perks and discounts that couple apply, have been applied. Once we get a confirmation from the cruise line with your booking, we check that carefully to make SURE they’ve got all our discounts and benefits applied. You know what - we do even more than that.So, you are in good, capable hands with us. You don’t need to worry about a thing. We got this. Here are even MORE reasons why veterans and military folks like you should book your cruise with Military Cruise Deals. We apply our military discount to all cabins that contain any friends and family of military personnel – so your whole group gets our discount! If the price of your cruise comes down, we’ll get you the lower rate or the difference in the form of onboard credits or upgrades. This applies only until the final payment date. After final payment date, most cruise lines will not adjust the rates or provide onboard credit but may offer an upgrade at their discretion. You’ll pay the lowest possible rate – lower than if you’d booked with the cruise line directly, on-base agencies, or other online cruise websites. We help you save even more money on travel insurance and shore excursions. We never charge booking or cancellation fees of any kind! The cruise line penalties apply as usual though! We’re always available by phone – so you can get excellent customer service from a cruise expert every day of the week! We aren’t just order-takers. We are experienced cruise travel agents! We make phone calls like that on a regular basis, because – even after our clients book with us – we’re always on the lookout for ways they can get more and pay less. Between the time you book your cruise and on your final payment date, if we notice that it becomes less than what you paid, we contact the cruise line and request that they re-fare your cruise to the new lower rate, upgrade you to a higher category, or provide an on-board credit for the difference. If you notice before we do, call us! Cruise lines do NOT always honor the request but we always try! Please note, Disney will NOT refare or upgrade after final payment date. Who qualifies for our military discount? Our cruise discounts apply to all U.S and Canadian active retired and honorably discharged military personnel (veterans) – and their friends and family. Seniors who are veterans may qualify for all senior and military discounts available. Click here to see how to indicate senior and veteran status on our site. While all spouses, dependents, family, and friends DO QUALIFY for the military discount from Military Cruise Deals, most cruise lines will often only allow the veteran and military discounts to be applied to the cabin which contains the member of the military. Thus, getting the maximum military discounts and benefits applied correctly is sometimes not an easy and obvious endeavor. We are experts on all the cruise line’s military and veteran discount policies: we know exactly when special rates and benefits pop up, who qualifies for them and how to get them applied. 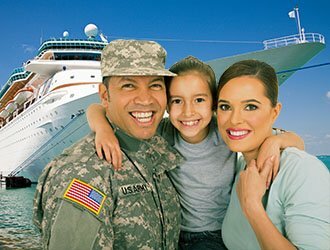 Our agents are experts in military discount policies and procedures and will know exactly how to help you book a cruise and get the best deals for all military and veteran groups and families. At Military Cruise Deals we often hear "Your offer is better than what I booked directly with the cruise line, how can I get your offer?" The answer is quite simple as long as you booked directly with the cruise line and not with another agency. If you transfer the booking to us, then you get to keep the same cabin, same booking number, and the same rate as you have with the cruise line. You will also get to take advantage of our offer. Plus, we automatically monitor the rates for any rate reductions for you! Even your non-military friends and family can take advantage of this great opportunity! We will add our extra discount to ALL CABINS traveling with you, regardless of their military affiliation. The cruise lines have made the process to transfer your booking over to travel agencies very easy. So, transferring your booking over to MilitaryCruiseDeals.com is an easy way to save money by having us add our exclusive discount and sometimes more! Contact us today and see what special offer your cruise booking may be eligible to receive. If you are past your final payment date or booked more than 60 days ago, the cruise line will not allow a transfer to us. You may be able to transfer with a quick phone call or online procedure! Keep reading to find out more. You may transfer your cruise booking to Military Cruise Deals up until 60 days from creation as long as your request is made outside of Final Payment period and the booking has not been paid in full. If a booking has a ChoiceAir ticket or if the transfer request involves a change in currency we cannot accommodate a transfer. You may transfer your cruise booking to Military Cruise Deals within 90 days of making the original booking as long as it is not past the final payment date. In order to transfer the booking, please provide us with your booking pin number and we will be able to transfer it over for you. If you don't recall adding a pin code to your booking, please call Carnival back to add one to the booking. Also, please forward your confirmation from Carnival to us at info@militarycruisedeals.com. Having issues with this process? Contact us for assistance! You may transfer your cruise bookings to Military Cruise Deals any time before final payment. If you have made the deposit on the booking then you must send a letter to Cunard. Please contact us for the mailing address and assistance with the letter. We can accept booking transfers from Disney but have to do it for you. Please contact us to begin this process. Feel free to ask how much we can save you by re-booking you with our discount! Reservations may be transferred to Military Cruise Deals up until 30 days from being booked as long as they are not paid in full. NO Deposit on Booking: call Norwegian Cruise Line at 877.397.1502 and tell them you'd like to transfer your booking to your travel agent. They will need your travel agents agency name and phone number. The number is 866.964.5482 and tell them your agent's name is Mitch from Military Cruise Deals. Deposit on Booking: you'll need to fill out their simple transfer form and email or fax it in. You may transfer your MSC Cruise Booking to Military Cruise Deals anytime prior to making the final payment. The agency transfer form has to be signed by the guest and then sent by email to mscexistingreservations@msccruisesusa.com or by fax to 908.605.2600. Please contact us if you need any assistance. We're happy to help! You may transfer your Holland America Cruise booking to Military Cruise Deals as long as you have not made the full payment. To transfer booking, you call Holland America reservations at 877.932.4259and give them our agency name Military Cruise Deals and phone number 866.964.5482 and let them know that you are requesting the transfer. You may transfer your Princess Cruise booking to Military Cruise Deals as long as you have only paid the deposit and booked less than 60 days ago. To begin, click below to download the transfer form. You will need to include our agency name Military Cruise Deals and phone number 866.964.5482, your name and booking number. This process can take a few days. Once it's done you will receive an invoice from us including your additional discount! Feel free to contact us if we can be of any assistance! As long as you made your Viking River Cruise booking in the last 60 days and have not paid it in full, then you can transfer your booking to Military Cruise Deals. The process is easy, just contact us to get started.